Art and design paired with French cuisine and fine wine at this Four Seasons restaurant. 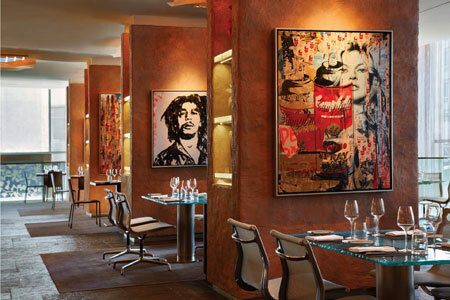 Daniel Boulud was GAYOT's 2014 Best Restaurateur in the U.S.
: Guests are greeted by life-size paintings of Bob Marley and Marilyn Monroe, courtesy of artist Mr. Brainwash, as they are ushered to their seats at Café Boulud in the Four Seasons Hotel Toronto. With minimalist furniture, concrete pillars and floor-to-ceiling windows, the restaurant has more of an art gallery feel than that of a Daniel Boulud fine dining establishment. Chef Tyler Shedden delivers on the gastronomic side of artistry with an array of delicately designed dishes, presented in four culinary muses: “La Tradition” (classic French cuisine), “La Saison” (seasonal delicacies), “Le Potager” (the vegetable garden) and “Le Voyage” (international flavors). Diners are encouraged to select one dish from each muse, or mix and match a combination from any of the four groupings. At lunchtime, a prix-fixe menu will decide for you. Among dinner entrées, we recommend the smoked herring with rye berry crumble, the roasted monkfish with saffron and mussel bisque, and the celeriac agnolotti with glazed chestnuts and truffles. The hazelnut chocolate bombe is the ultimate finisher. Pair your food with a carefully chosen wine from wine director Drew Walker’s 350-plus-bottle selection. Weekend brunch is worth exploring as well.